July 5,2105 Trucker Charity made it's maiden voyage this week. A driver for Kennesaw Transportation, Inc.has asked for our help. Her mother was riding with her on what she expected to be an out and back trip when her mother suffered a stroke in Chicago, Ill. Not knowing how she was going to get her mother home she called us. We took her application, made a few phone calls and told her we would be sending the "Trucker Charity" Am Coach to transport them home. Mark Lowthrop, our driver of the Am-coach left his home in Clinton Arkansas yesterday and arrived in Chicago this am. The clients mother is getting settled for her journey to Kennesaw Ga. This is the reason we purchased the coach and hope to help even more people in the future. Mark Lowthrop is a retired driver who selflessly donates his time for this. There is no charge to the family for this service. 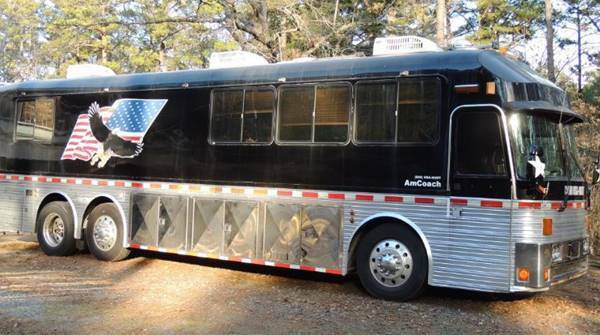 If you see the "Trucker Charity" Amcoach on their journey to Ga. give them a shout out and a wave. Just FYI: An ambulance would have cost them upwards of $5000.00 and an air ambulance even more.Most of which most insurances would not pay. Getting them home will allow these sick or injured to be around their loved ones while they are healing. Instead of in some distant place where they know no one. The stroke patient ,her trucker daughter and their dog, were safely taken to a hospital in Truckee, Ga, near where they live for evaluation before entering a near by nursing home for extended care and rehabilitation. Mark did an excellent job of getting her home safely and comfortably in a 1378 mile run. More to come about this ride. Support Trucker Charity, Inc. so that we can continue to do these and the other services we offer. Donate Today. Please and thank you for your support. Mark will be traveling to Wallcott Iowa for the Iowa 80 Trucker Jamboree. Keep an eye out and give him a wave trucker style. Trucker Charity Inc. will be continuing to carry on the mission of Bob Hataway. The AmCoach will provide specialized services in transit not available on standard modes of travel after suffering from accident, illness, or injury away from home. The AmCoach is equipped with a kitchenette, living quarters, lounge area, and large luggage bays that can accommodate a driver’s possession to be brought home with them. If the driver has a pet they are permitted to travel with their owners. The AmCoach requires a family member or friend to travel with the client to give assistance in transit. If medical services are required it is the responsibility of the family to provide them. Trucker Charity Inc. will coordinate with the hospital to provide transportation. When the coach is not under dispatch it will visit truck stops and truck shows. In the event of a natural disaster the coach will function as a Disaster Relief Center. We are looking for 100 people that will sign up for donations of $20 a month. This will go a long way toward funding the operating cost of the AmCoach for the year. Of course any amount would be helpful. Trucker Charity has introduced a new tool to assist with their quest to help truck drivers who find themselves in need while on the road. The AmCoach is a motor coach designed to transport drivers home after they have suffered an injury or illness. The AmCoach is more than just a free ride. It features a kitchenette, living quarters, lounge and plenty of space for luggage. When a driver needs transportation home or to a treatment facility closer to home, the AmCoach is available to get them there in comfort. A friend or family member must travel with the driver to provide any necessary transit, and medical care is the responsibility of the family, but the ride and the accommodations are completely taken care of. Truckers who travel with a pet can bring them along too. The organization operates on donations, and its active volunteers cover most of the costs. It is currently seeking donors to help maintain the AmCoach services. The AmCoach can also function as a disaster relief center in the event of a natural disaster. When not on duty, the vehicle will be on display at shows and truck stops. One of the first stops will be the Mid-America Trucking Show next month. “We encourage everyone to come check out the AmCoach and see what we are about and what we hope to do in the future,” Wood told Land Line. Green Summit Features Navy Capt. Copyright © 2014 Go By Truck, Inc.